22 Michaels: Shoes of Prey launches in Japan! In January this year we received an email from Yusuke Mitsumoto asking if we'd be interested in working with he and his business partner Jun Haranaga to launch Shoes of Prey in Japan. We receive a few similar emails each week and we generally explore them a little but we were particularly interested when Yusuke got in touch with us. Firstly, Japan is the third largest economy in the world, it's a very prosperous country of 128 million people and it's such a different market to Australia. I saw this first hand when I was at Google. Japan is the only market in the world where Yahoo leads in search engine market share, and it needs to be treated very differently to other markets. We've also seen with Shoes of Prey how different Japan is. We're selling lots of shoes in markets like Australia, New Zealand, the US and UK. We've had sales in most European countries including quite a few to Russia, Germany and Italy and we've even had a few sales in China! But we've not sold a single pair of shoes in Japan. As Google do, it's clear we need to treat Japan differently to other markets and local marketing and customer support is the best place to start. Secondly, Yusuke and Jun launched and run a very interesting car sharing business in Japan called Cafore. I love car sharing, we use GoGet in Sydney, and Cafore is a slightly different take on car sharing. People can rent out their own cars to people who live nearby. Cafore organise this process, as well as insurance to cover the renting driver and take a cut of the rental fee. It's a new and different approach to car sharing, it's going really well and Yusuke and Jun have managed to get a lot of press coverage for the business in Japan. Their CV's interested us too. Jun used to be a software engineer at Yahoo! (a very similar role to Mike's at Google) and Yusuke was an account manager at the advertising agency Ogilvy (a very similar role to Jodie's at The Campaign Palace!). We had a few discussions on Skype and we clearly had very similar thoughts on the business. So once we'd talked through the basics of how we could work together, Yusuke jumped on a plane and spent 4 days with us in Sydney. And we got on brilliantly. In addition to thinking the same way about things like the importance of customer service, we enjoyed spending time with Yusuke personally as well. So Mike and Yusuke have been working closely together for the past month on the translated version of Shoes of Prey and moving forward we're going to take care of the technology and manufacturing while Yusuke and Jun take care of the marketing in Japan and the customer service. It's with great pleasure that we present to you: Shoes of Prey Japan - www.shoesofprey.jp which officially launches tomorrow. 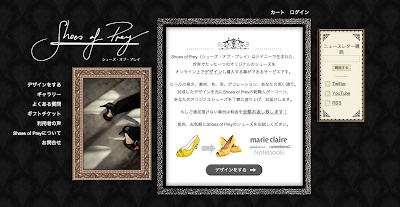 How does shoesofprey.jp work on Mobile? Also the designer? Brendan, that's a good question given Japan is the world's most advanced mobile market. We haven't optimised the website for mobiles, and given our designer is built in flash it doesn't work on the iPhone. We're planning to see how the market reacts to the product and if the response is positive, we'll look to improve the website experience for mobile users. Let me know if I can be of any assistance to you and your team in Japan..I am happy to make any introductions or connections here in Tokyo.